There's an article (not on-line) in today's DomPost about the government's intended new approach to gangs. Apparently Anne Tolley and the Deputy police commissioner went to LA to see what successful strategies look like. One of them is a "charter school open 365 days a year". It's quite a long read with input from gang members and their families, some support and some cynicism. The Police commissioner however makes the point that he has a "secret weapon". That's the older generation of gang members who want a better life for their children. "We are not going to back off...that's our job. But if people want to try something different, establish a better way for the young generation and they are sincere...then we need to show we are sincere about that too." "$5 million (cost includes crime and welfare); 423 victims; 14 members; 3 generations and 93 years spent in jail." I'm ambivalent about the subject having spent a bit of time with a gang member who wanted me to paint him and his kids. Which I did and thoroughly enjoyed. He wanted out but it's hellish hard. It's personally very dangerous for someone to turn their back. Last I knew he was getting there with support from non-gang extended family. Another friend described how she'd visited prison to pay a 'gang boss' to release her partner. Could be true. Unbelievably, the partner went back to the gang later and wanted their son to join as well. Only the communities from which gangs come can make an end to the violence and victimisation. Perhaps if police and other government agencies want to work with them, matters will improve. I don't know. Gangs just seem to provide an outlet for something dark and desperate in some people's psyches. As Jarrod Gilbert points out, they often bite the hand that feeds. There must be some stronger instinct not to be tamed. Mike Treen would like me to print his "devastating response to rightwing , self-professed “expert”, Lindsay Mitchell and her nonsensical “graphs” " as described by Frank Macskasy. My response has been left as a comment. The number of working-age people on benefits is actually higher than the number of unemployed or jobless. The debate has just become very silly. (Thanks by the way for the comments regarding whether there is any point in getting involved in this manner. "But, even when we combine the benefit numbers, the huge gap between the number on benefits and numbers measured as jobless remains." The debate with Daily Blog writers continues. I always link to their assertions; explore and attempt to rebut or explain them. They never link to mine and simply discredit them. I have responded, in part to ask why he hasn't linked to my "attempts" and am currently in moderation. The last thing I want is to sound like Metiria Turei whimpering about National's so-called "racist" attacks on her attire when she can give as good as she gets. The insults don't particularly worry me. The poser for me is whether to bother debating with the left? Does any good come from it? Libertarianz leader Richard McGrath today [3 Feb] confirmed that the Electoral Commission had last week deregistered the party at its own request. "Senior party members had been discussing for several months how we might get more bang for our buck, and it was decided to continue as a ginger group and/or think tank rather than as a registered political party." It's sad yet good news. The libertarian vote is too splintered. If ACT is now uncompromised in espousing libertarian ideas there will be energy freed up from the deregistration of Libz. And Libz activists are very committed. It's well known in politics that a few very motivated individuals can make a noise and impact which far outweighs their actual numbers. I've been debating with a couple of people via blogs/newspapers about welfare matters. Here's a response to an earlier letter published in the Dominion Post. Correspondent Teresa Homan doubts the veracity of my statistics and wants to know where they come from. The answer is, this newspaper, which reported in November last year, "More than 5000 people are collecting benefits because drug and alcohol addiction is preventing them from working". I am assuming the information was released under the Official Information Act. It is, in any case, consistent with my own earlier requests. Thanks for trying to rebut my graph. I have redone it for the combined benefit numbers (Unemployed, sickness and invalid together). It shows a somewhat less dramatic but still dramatic gap opening up between numbers on benefits and the broader Jobless number. The Jobless number goes from being regularly 20-50,000 above the combined benefit number to being 50,000 below the number. Here is your graph when done properly. 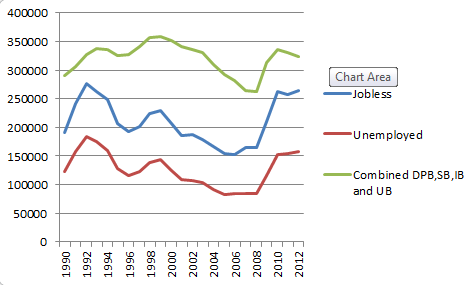 Your HLFS graph line has now switched to "jobless" rather than "unemployed" producing a higher number. The last time the "jobless" were above the number on benefits was the period during 1989 - 1993, also a substantial recession which featured higher unemployment than the latest. 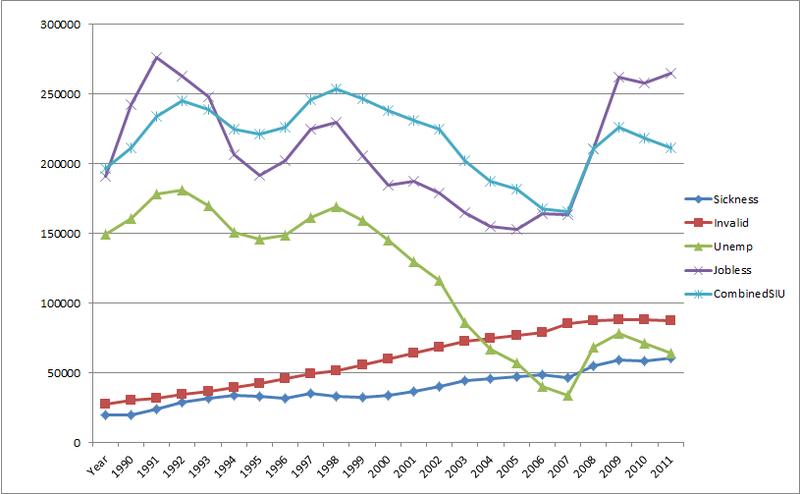 Which bears out the points I've raised about the nature of the unemployed during recessions. They have more assets; they are more likely to have a partner; they are more likely to be short-term unemployed - all of which, rightly or wrongly, prevent them from accessing a benefit. Anyway, had you included your original graph line of officially "unemployed" it would fall well below the number supported on the combined SIU. Why did you drop it? The combined efforts of both National and Labour governments’ punitive policies towards the unemployed seems to have removed over 100,000 people from rightful access to an unemployment benefit. I notice this morning already much of the advocacy for increasing the minimum wage focusses on being able to feed children. Yet most minimum wage earners are single and childless. When they do have children they are often part of a couple with the other earning considerably more. In 2011 our minimum wage was 60% of the median earnings for full-time workers. 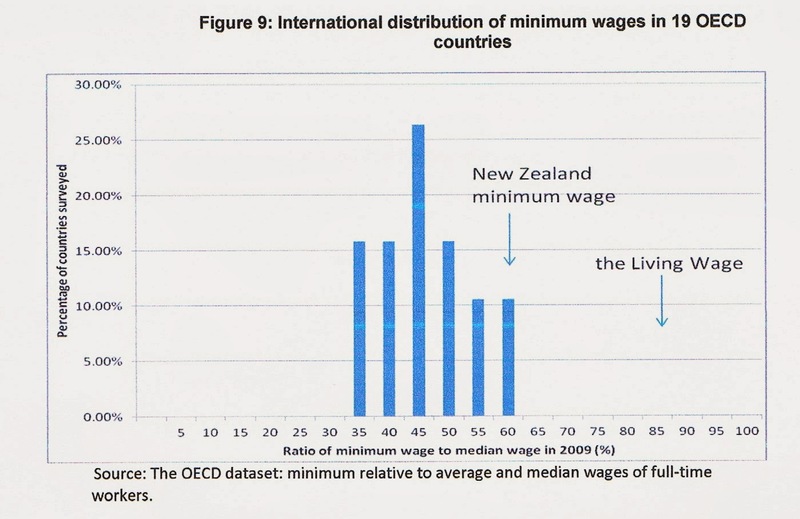 This was amongst the highest ratios in the OECD, and well above the level found in most countries which is typically around 45%. For instance, the ratio was 45% in Australia, 38% in the United Kingdom, 40% in Canada, and 28% in the United States. 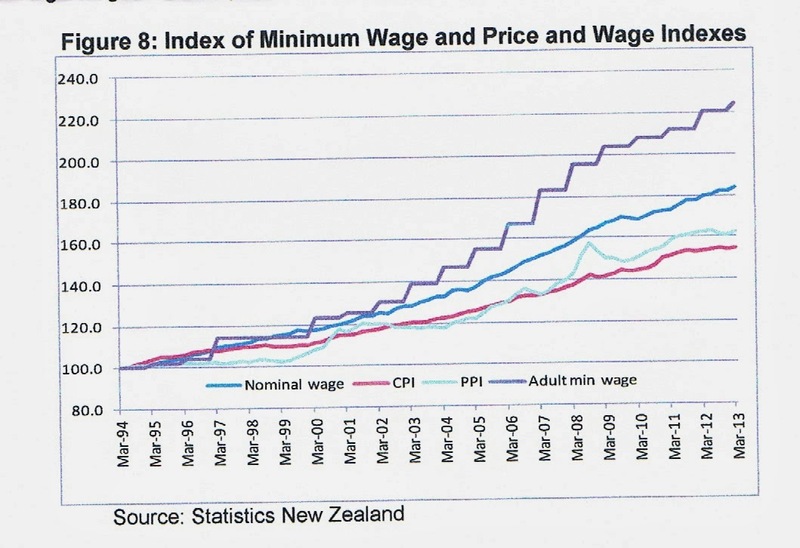 Increasing the rate still higher to 88% of the median wage would take the minimum wage well outside the normal range. This is likely to make employment for people with low skills difficult in an internationally focused economy. 2011 was the most recent date on which comparisons were available from the OECD. 63 percent of households earning below $18.40 are single adults without dependants. The current objective of the minimum wage is to protect the real incomes of low wage earners, while minimising job losses. It is not an effective mechanism for reducing poverty on its own, nor is it intended to be. Instead, there are other measures, like income transfers, subsidised access to health and education services, and childcare assistance, to improve the wellbeing of families with low incomes. Raising the floor on wages will... always provide greatest benefit to younger people, and especially to those in the teens and early 20s."